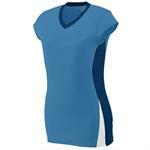 New Lt Weight Wicking 90% Poly/10% Spandex Micro Jersey with four-way stretch properties. This Ultra-Fitted style features an eye-catching 3 color design of wrap-around set-in inserts in light weight Pin Dot fabric. 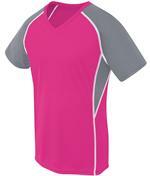 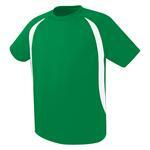 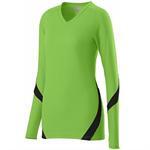 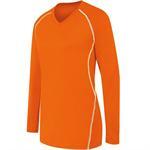 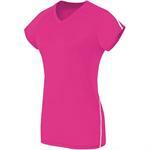 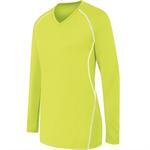 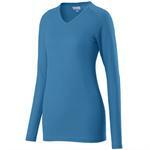 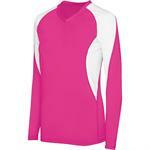 Main fabric: lightweight wicking 90% polyester/10% spandex stretch micro jersey with Essortex moisture management. 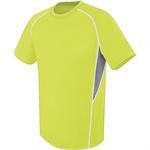 Inserts: Lightweight pinhole mesh 92% polyester/8% spandex. 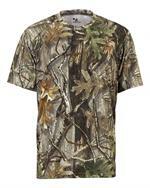 Main Body in 92% Polyester / 8% Spandex with Essortex wicking properties for comfort and breathability. Piping details. 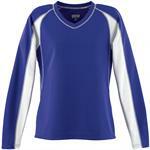 100% Polyester Micro Interlock fabric features Essortex Wicking and Mechanical Stretch properties. 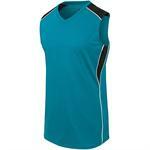 Contrast inserts of Lt Wt Pin Hole Mesh 92% Poly / 8% Spandex add extra breathability and stretch. 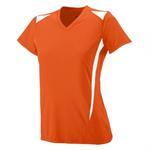 This Ultra-Fitted style features a 3 color design with set-in shoulder and side panel in light weight Pin Dot fabric 92%polyester/8%lycra. 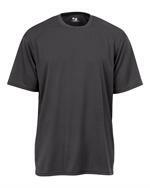 Contrasting self-fabric cross-over V-neck.